Despite my love for football, I’d never been to Gillette Stadium – home of the New England Patriots. And I never suspected that when I did get there, I’d be amidst throngs of screaming adolescent girls who were swooning over the five adorable lads of One Direction. I should have been prepared for the frenzy after hearing a remote comparison to Beatlemania. One Direction themselves reported in an interview that American fans are their loudest and craziest. But truly, I had NO IDEA. Husband, a seasoned tailgater, packed the family SUV with coolers, grill and food. 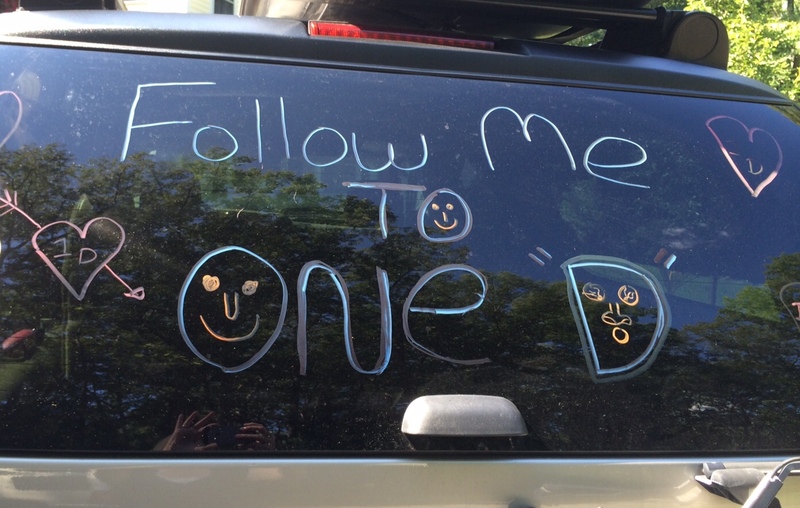 Good sport that he is, he also decorated the windows with One Direction tribute. He, too, was taken off guard when observing that the men’s bathroom at Gillette, normally packed with obnoxious football fans, was so empty he ‘could have played whiffle ball’ in the vast space. In short time, the men’s bathroom was converted to a temporary Ladies Room in order to accommodate the sea of females waiting in line. Husband and I laughed about the contrast between this and our own teen concert experiences with rock bands of the 80’s. Cell phones have replaced hairspray torches (thank God), and LED graphics have replaced strobe lights. But in spite of all the differences, one thing remains the same – teenage obsession. I recall the internal pandemonium – the feeling of coming unglued at the sight of my celebrity crush – a rockstar, an actor… I see girls quivering and crying, hear their frenzied screams, and feel their pain. Complete surrender to the allure of a star is intoxicating. He’s singing to me. He means his words. He loves me too – didn’t he say as much in his song? I’d dream of my hero, unable to shake the memory of seeing his face, albeit on a jumbotron from 2000 yards away. He was there! He was real!! I wanted desperately to be recognized. If only I was famous too. Then life would be great. At some point the crushing reality sets in that no, your rockstar crush didn’t see you. He won’t ever know you, and elation gives way to depression or disinterest – until the next big thing comes along. Thus goes the cycle. What I didn’t realize as a teen was the flip side. What happens to the star at the end of the show? The tragic death of Robin Williams makes it difficult to avoid the topic of the dark side of fame. In a 1981 television episode, Robin, as the character Mork, says, “being a star is a 24-hour job and you can’t leave your face at the office…some can’t take it.” Chilling. 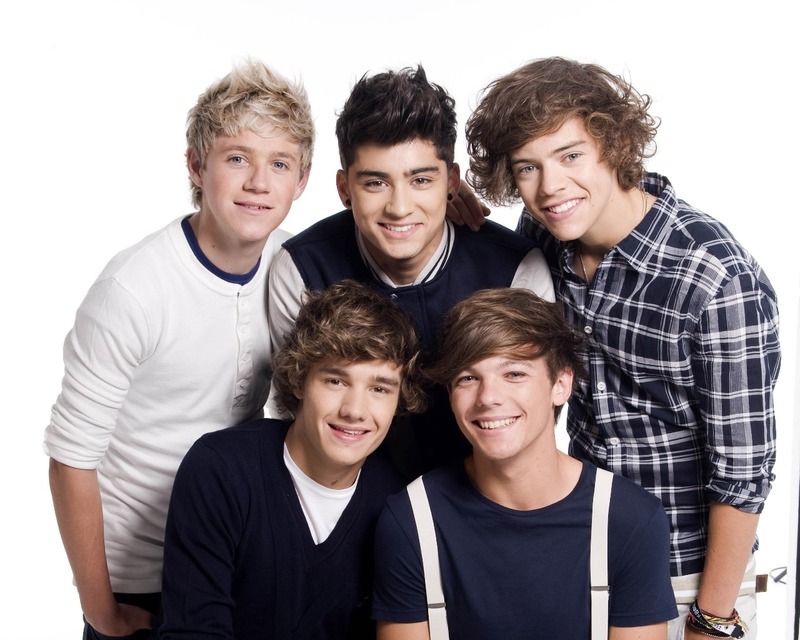 Truth be told, I actually enjoy One Direction. I tap my foot to their music and applaud their clean image. But I worry about them. They are so young. And so suddenly popular. So instead of dreaming of them at night as I’m sure my daughters do, I pray for them. Please be okay lads, even when the fickle little girls turn away. On the current episode of City Girl in the Country, the Dunhams are raising chickens. For real. 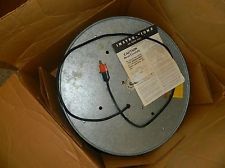 Our story begins months ago when teen daughter got word that Grandpa was looking to pass on the circa 1985 incubator that I, Mother, used in high school to hatch chickens for a science fair project. Thus began Principessa’s campaign to revive the experience. Principessa echoed with “Mom, I only have two more years. Then I’m GONE.” (To college, that is.) Principessa’s new go-to source of ammunition is her impending departure from our household. She knows this pulls on her parents’ heartstrings and bends our sympathies in her favor. Home to the miracle of life. To deny my excitement about the process would be a lie. I adore a birth story. So much so, that I became a doula after I was done birthing my own babies so I could still be part of the process. But I drew the line at hatching. We would NOT be keeping chickens. As incubation days ticked by, Principessa and I became increasingly attached to….eggs. Which, as it turned out, are what all seven were – just eggs with potential. In poultry world they’re called ‘quitters.’ I mean, really, how insensitive! We were crushed. 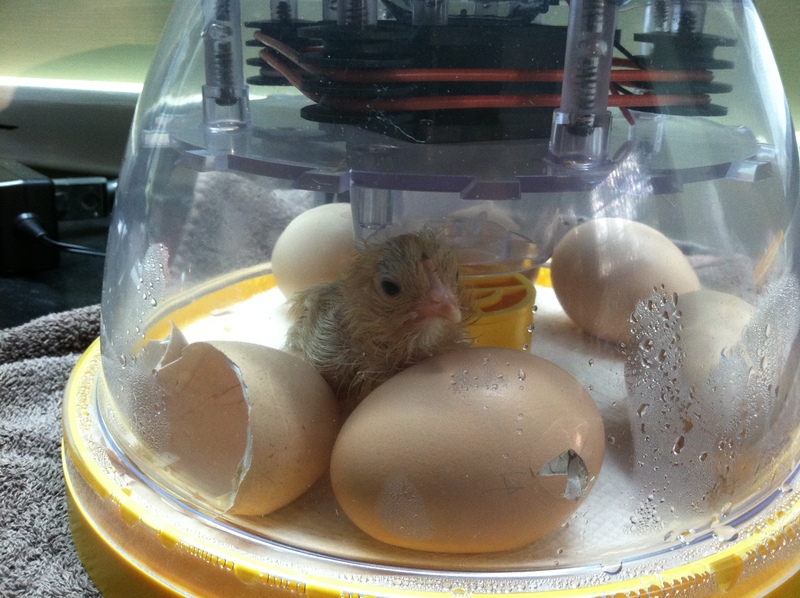 With hatching fever running rampant, we decided to purchase an updated incubator and a new clutch of eggs. When we candled them at day 13 of 21 and saw definite signs of life in 6 out of 7, Principessa screamed so loudly that husband came running, thinking an egg had exploded. Instead, he found Principessa and me hugging, crying, and rejoicing for our little chicks. Husband admonished us for scaring him, shook his head and walked away grumbling about our insanity. 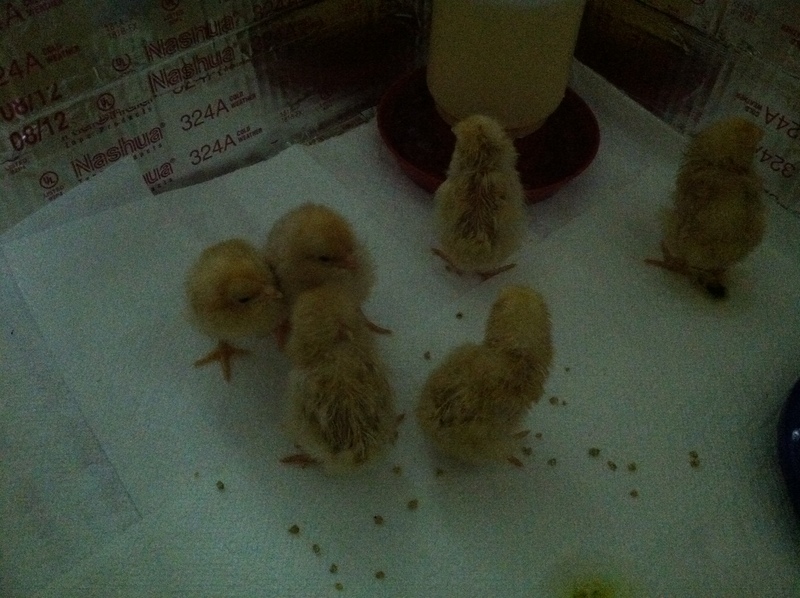 It was around this time that I caved in my resolve to put the chicks up for adoption. I postulated that raising chickens was much less of a commitment than other pets we’ve entertained. And besides, we love fresh eggs. You can imagine how the rest of the day progressed. Principessa and I kept our noses pressed against the incubator for hours, content to watch and wait and listen to the happy sound of peeping. When husband insisted that we tear ourselves away to the kitchen for a family dinner that he had cooked, we reluctantly agreed in hopes that there would be progress in the other eggs upon our return. Not fifteen minutes later, Beagle left the table to retrieve a ringing phone and announced that another egg had hatched. Husband was duly remorseful. Now all we need is a hen house, which husband offered to build. He did not promise the Taj Mahal but he did promise Fort Knox. There are numerous predators surrounding our house, waiting for chicken dinner. Husband is handy, yes, but not a professional builder. So I borrowed a book from the library: “Building Chicken Coops for Dummies” which I asked husband to pick up on his way home. He refused on the premise that it would be like telling a man to ask for directions. Not happening. So I retrieved the book myself with the intention of reading it TO him. Won’t that be fun? I do hope chicken-keeping will go better than vegetable growing. We are learning as we go, but are confident that we’ve made a good choice. Stay tuned. And move over, Farmer Brown. City Girl is taking the country by storm! Three days after April Fool’s Day, the Dunhams are still decompressing from the annual frenzy that is generated by five pranksters under one roof. April 1st ranks at the top of our list of major celebrations. 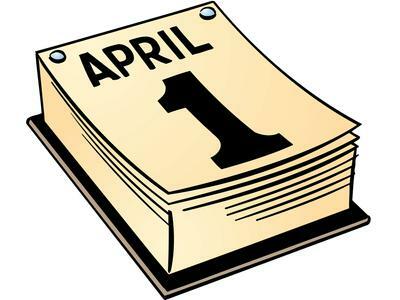 In the early years of marriage I was dragged through the April Fool’s tradition by husband, a career jokemaster. It was no fun trying to compete with his level of expertise. (As a child he put dog poop in a sibling’s pillow!) But when the kids came along and husband apprenticed them, I had to get in the game. I began modestly with the old standbys: books in the pillow, traps on the toilet, early morning alarm clocks under beds…and finally reached the big leagues the year I sewed husband’s underwear together. The competition has gotten so fierce of late, that the formation of alliances is a must. Husband and I began plotting against the children a month in advance. Our biggest hit was a scheme that required a late night setup. Giggling like schoolchildren, we snuck upstairs in darkness to cover bedroom doorways with newspaper and fill the space between paper and door with ping pong balls and popcorn. Suspecting foul play, Beagle emerged from his room with paintball mask donned, armed for an attack. He responded with flour in the hairdryer that blew into my face when I turned it on. Principessa had a more subtle style. She created a fake ‘Failure To Pay’ parking ticket notice to the tune of $200 which husband was chastised for. Little Peach, a novice at nine, stole and hid everything she could – toothbrushes, curtains, socks – and toilet papered her sister’s room. Husband likened her to a civilian with a water gun trying to fight experienced terrorists. The house was like a war zone, destroyed within an hour of sunrise. By day’s end, more than 200 pranks befell five Dunhams. No living creatures were harmed and all were applauded for a high level of ingenuity and sportsmanship. Cleaning up the fallout is a bear, but so worth it. Please share your best pranks so I can begin my list for next year! The stakes are getting higher every year and I need new material.